Carly Callaghan, Residential Property Solicitor at Thompson Smith and Puxon (TSP), discusses what you are permitted to do with your front garden and how the current vogue for paving may have contributed to the recent floods. 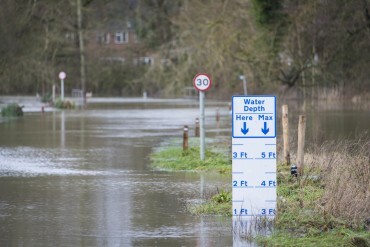 Flooding has dominated the news for the past few weeks and it is clear that it is now a major environmental issue which is affecting thousands of homes. Although the focus recently has been on rivers and the coast, surface water flooding is also a concern as local drainage systems, often built many decades ago, struggle to cope with the sheer volume of water. Paving over front gardens has had a big impact and more water than ever before is flooding into our drainage systems. It may seem hard to believe that people paving over their front gardens can cause surface water flooding but with many people on many streets doing this, it has a combined effect. By replacing flower beds and grass with materials like concrete and asphalt, water is not able to soak into the ground and this leads to surface water flooding. To address this problem and reduce the flood risk from heavy rainfall, the Government limited permitted development rights in relation to paving over front gardens. From 1st October 2008 (in England), any new installation of impermeable paving, such as asphalt, in front gardens, which exceeds a size of 5 square metres, and allows uncontrolled rainwater to run into the road requires planning permission. If you are considering having your front garden paved in any way, it is best practice to use an experienced landscape or driveway contractor that is knowledgeable about the 2008 legislation. In addition, if you are planning a new access across a pavement you will need to obtain permission from the local council to drop the kerb and if necessary strengthen the pavement to protect any service or utility pipes underneath. If you are purchasing a property, inform your conveyancing solicitor as soon as you spot a paved over front garden that is bigger than 5 square metres. Your solicitor will then raise enquiries to check whether it was laid after 1st October 2008 and, if it was, that it complies with current legislation.